I started the long weekend with a movie date with my bestfriends. Minsan lang mag-aya si Erlie kaya kahit borderline pulubi na ako, gorabels and lola nyo! She wanted to watch Bakit Hindi Ka Crush Ng Crush Mo? 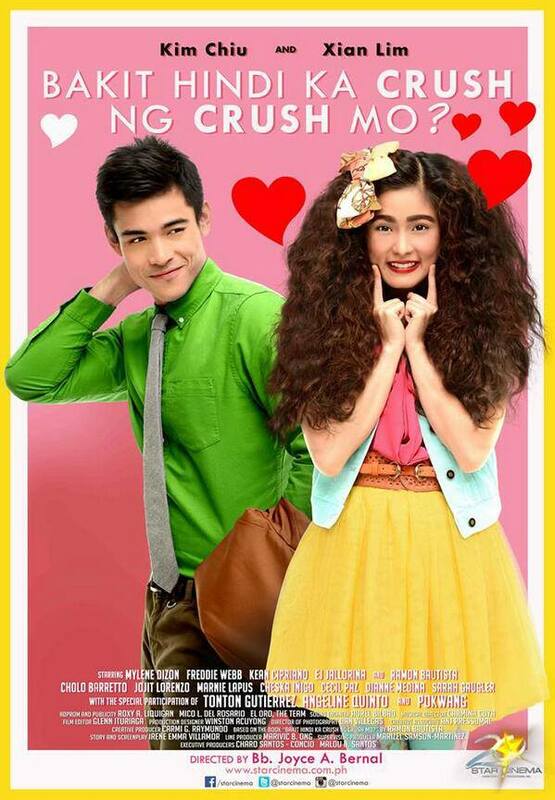 starring Kim Chiu and Xian Lim. I actually read the book, and so I was really interested on how they’d come up with a movie based on that book. Kasi naman, it’s not a novel! It’s just a collection of problems posted by Ramon Bautista fans and Ramon’s hilarious answers. Apparently, they just used the introduction on the book. Where Ramon Bautista gave insights on Wasak na Puso and the Reasons Bakit Hindi Ka Crush Ng Crush Mo. But the movie is wonderful. Don’t get me wrong, it’s not an award-winning kind of film with wonderful storylines and great cinematography but it’s definitely a fun film. I expect that anyway. Since it’s based on a Ramon Bautista book. I love that they we’re able to touch some really delicate themes without overdoing it or putting too much drama. I love that it shows moral lessons in the best way a Filipino can, thru comedy. Like that scene with RHBill and the manangs of the church. Like that finally-coming-out-of-the-closet-scene of Maximo (Kim’s brother). Pokwang’s religious practices that actually made her not notice that her children are growing up and are having problems of their own. Pero promise! Matatawa ka habang napapaisip. I love it! But I guess everything boils down to Kim’s performance. I am not a Kim Chiu fan. Ang payat nya. Ayoko sa kanya. But she has proven her worth thru this film. She is hilarious!! Subtle na mga banat pero andito eh (sabay turo sa dibdib/puso). The way she said PAKSHET! Ang lupit! Bet ko! And ang bonggang red pekpek shorts after that stint with Xian (where Xian broke her heart) is just waaaay awesome. Sana ganun ginawa ni Sarah sa It Takes a Man and a Woman instead of removing her jacket. Red pekpek shorts for revenge!! BET!!!! Another fave character is Maximo. I just to specifically mention him. Though the entire cast did a great job. Even Mylene Dizon’s OA acting is superb. But Maximo is just waaaaaayy too funny. Walang linya, taas lang ng kilay, hagalpak na ko sa kakatawa. Hindi ko sya kaya teh! Just watch it guys. Promise. Hindi masasayang ang Php200 nyo. It’ll give you a good laugh.